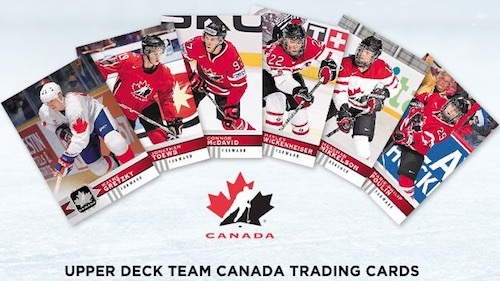 Bringing even more UD exclusives to our northern neighbors, 2017-18 Upper Deck Canadian Tire Team Canada takes a national hockey team approach with a full promo set. Exclusive to Canadian Tire, an automotive/sporting goods/hardware/home goods retail chain that sells quite a bit more than just tires, the 2017-18 Upper Deck Canadian Tire Team Canada promotional release starts on December 1 and goes until December 28, 2017 (or as supplies last). The five-card packs run $1.99 CAD (before tax) with any purchase, and it is up to the specific location to decide the number of packs you can purchase in a single transaction. This concept seems quite similar to the immensely popular 2017-18 Upper Deck Tim Hortons, except the coffee promo is an NHL set while this obviously focuses on Team Canada. The 2017-18 Upper Deck Canadian Tire Team Canada checklist is actually pretty robust with 160 cards in the main set. The breakdown includes 100 base cards, 40 base Short Prints, and 20 more cards that are part of the Heir to the Ice subset. In addition, limited Gold Foil Signature and Black Foil Signature versions can be found for select players. 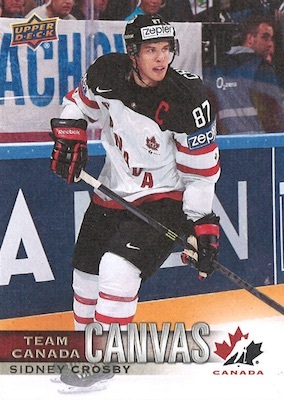 2017 Canadian Tire Upper Deck Team Canada inserts include Team Canada Canvas, which features 45 main cards and 10 high-number Canvas Short Prints. 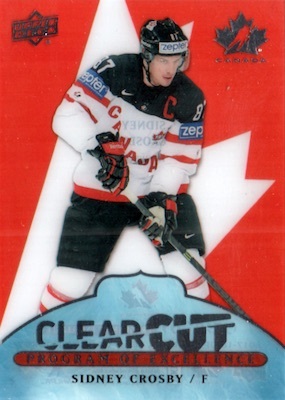 An acetate favorite, the Clear Cut line offers Program of Excellence (30 cards) and World Juniors (10 cards). 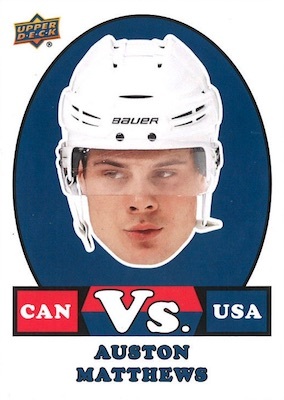 Finally, the 12-card OPC Retro set highlights all-time greats from the program, while Vs. (versus) draws attention to 24 top NHL players who represent other countries. Collectors can find 13 of these players also featured in the Vs. Signatures parallel. There is no collector album for the set, and 2017-18 Upper Deck Canadian Tire Team Canada pack odds will be added if they are released. 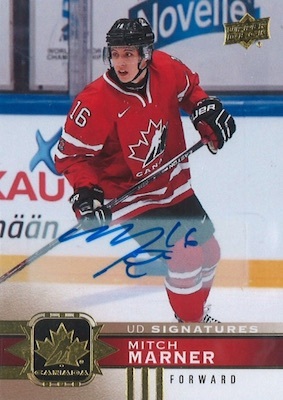 MIKE GARTNER SIGNED 17-18 UPPER DECK CANADIAN TIRE TEAM CANADA CARD AUTOGRAPH! ROGIE VACHON SIGNED 17-18 UPPER DECK CANADIAN TIRE TEAM CANADA CARD AUTOGRAPH! DALE HAWERCHUK SIGNED 17-18 UPPER DECK CANADIAN TIRE TEAM CANADA CARD AUTOGRAPH! 160 cards. Shop complete base sets on eBay. Includes 40 base short prints (1:2.5 packs) and 20 Heir to the Ice (1:10 packs). PARALLEL CARDS: UD Exclusives Silver #/100, UD Exclusives Gold #/10, Printing Plates 1/1. 104 cards. Shop on eBay. Specific group pack odds noted below. 118 cards. Serial numbered #/5. 55 cards, including 10 short prints. 1:5 packs. Shop on eBay. 1987 SP Odds - 1:48 packs. 30 cards. 1:96 packs. Shop on eBay. 11 cards. Overall odds - 1:288 packs. Shop on eBay. Odds are not known for the unannounced Nolan Patrick SP. 12 cards. 1:17 packs. Shop on eBay. 24 cards. 1:6 packs. Shop on eBay. I really hope the print run will match the huge checklist. May be difficult to build a complete base set. This set was to be released today. It has been all over ebay all week being sold by the case, set, individual cards and so on. Customers are suppose to be able to purchase these cards starting today. You would think Canadian Tire and Upper Deck would have some sort of control unless store owners can do what ever they want with the stock. I sent a message to Canadian Tire a few days ago and am still waiting to hear back. Making a comment from Marks comment. I agree with you you Mark.I bought a few packs at a Canadian Tire on Nov 30th,that would be there mistake thoygh,have the receipt to prove it.As far as cards being available on E.bay before the actuall release date is absolute B’S.That same crap happened with the Tim Horton hockey card set.Cards where available 10 days,on E.bay,before the the release date. It’s become pretty apparent to me now, that an Upper Deck employee is a theif,and that individual(s) has to be caught,charged with theft and fraud,plus fired.Hockey card collecting is supposed be fun and exciting for parents and kids,and for the collectors like myself! I put quite a bit of money into the Upper Deck products,but knowing that a theif(s) are out there has made me bitter! I hope Upper Deck launches an investigation to figure out who is responsible for these actions! It’s a bit extreme to suggest that the reason cards showed up early is due to a thief at Upper Deck. Unfortunately, this is not an issue for just UD as cards show up early on eBay for nearly all the card brands. I agree that it is frustrating when the schedule is not honored, but once the product is shipped, it falls to the distributor or retailer to hold it back until the official release date. Sellers know that listing first can help sales, so it’s a race to get cards as early as possible. Mark Messier is #R-11 – Retro O-Pee-Chee, not Yzerman. I went today and had some issue locating cards from my local Canadian Tire. Someone from customer service brought the cashier some packs. I was allowed to purchase 5 packs max for my transaction. The cards are very nice. I do not think it is Upper Deck employees. I think it is Tim Hortons and Canadian Tire managers, owners or employees taking the product and selling it.The Canadian Tire Team Canada cards are being sold by the case. I think this is unreal, especially at the beginning of the release. It would not be hard to figure out if it was theft, as the sellers are not hiding it and are on Ebay. Very nice product, Tim Hortons style. They added some subsets from other products, such as the retro OPC and the Canvas. Overall, for the price, is a very good product. Note please that there are 5 cards in the pack instead of 3 like in the Tim Hortons packs. A small issue though, some of the base and canvas pictures are identical (see Weber). As for the other problem, there are many things to talk about. 1. No, this is not an UD employee, but store managers. Some will sell before the release date, some others after. Some will limit the quantity of packs per client, some others will not. It’s not an excuse, but they don’t manage hobby stores. They receive thousands of products they have to manage and they simply don’t care about some hockey cards, a product they do not normally even sell in their stores and they receive once every 4-5 year perhaps. UD sends precise indications, but not all of them care about. 2. Now, I checked this morning the inventory, and all the stores in Montreal or the big cities still have a lot of packs. So, if someone lives nearby a big city will have absolutely no issue finding the product. There are thousands of packs left. The problem arises with stores in small towns that indeed, many sold out the product. Since you cannot buy this product online, I image it must be infuriating for those people who didn’t even get the chance to purchase it because someone before the release date bought everything. 3. As Trey mentioned, business is business. The manager can decide if he wants to limit the quantity per client or not. And why is that? Well, in a big store, where they have 2000 packs, there are chances they get stuck with them if they sell pack by pack. Since this is not a hobby store, if people are allowed to purchase only 1-2 packs with a purchase, it’s very hard to sell them all, since not a lot of people will buy with their screw-driver or painting brush a pack of hockey cards, especially that this is not very publicized, as Tim Hortons was. Sure, they could limit the number of purchases at 5 packs, but who can forbid you to go 2-3 times a day, 5-6 times a week and still buy the number of packs you need? Or to send your cousin, brother, friend, etc. to buy for you. The truth is, these kind of collections, released in coffee shops and hardware stores, will always have these kind of problems, no matter what UD will try to do. Yes my comment about an Upper Deck employee being a thief may have a bit extreme to some.Although my feelings and frustration remain the same,i apologize if I offended anyone with my comment. I had the same thing happen to me at a Canadian Tire store,the manager said I could only purchase 5 packs at a time.I just simpley said,if I want to buy 10 chocolate bars are you going to tell me I could buy only 5! I showed the checklist and explained how Upper Deck can make it very difficult to complete a set,after giving that fact,i purchased 40 packs with no problem.Anyone that collects hockey cards would know I’m correct about how difficult and frustrating it can be to complete a set,this Canadian Tire set is proof,the last 20 cards Heir to the Ice,out of the 160 card set are going to be a problem.I have purchased 100 packs and only pulled 5 Heir to the Ice cards and 2 0f them where signatures. 100 packs and still need 4 cards to complete 1-100,So anyone that is told there is a limit of packs to buy,just explain. No one should have the right to you how many packs of cards you can purchase at a one time anyway! That does not happen at a Hobby Shop. Almost forgot,like any other Upper Deck product,this is a very nice set! It would be nice to be able to complete it a bit easier without spending a ton! I just came back from my local canadian tire. they had about a box per cashier. I bought an entire box without any problems. Awesome pulls. great looking cards better than tim hortons. 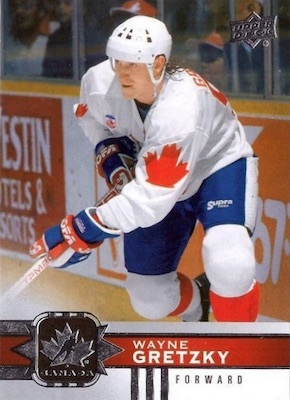 the base 100 cards set is easy to do compared to tim horton’s. I almost have a second complete set. Thanks! Seems to be lots of extras compared to what the “final” checklist showed. I have always built this set in the hobby format and i must say the quality of these cards is of a base brand upper deck or better. I just hope i can find enough traders out here in nova scotia or they have enough packs for me to be able to complete it. On a side note i was able to buy 85 packs at one time today without a hassle. I assume it could have been as many as i desired. but I’m still confused..I have over 500 cards so far…but not one of any of these cards… Gold Foil signature card =59 cards…Gold foil signature short prints =28 cards…Black foil signatures = 67 cards & Black foil signatures-short Prints = 33 cards…So how the !!! are we able to get a complete full set?..any suggestions? Those cards you mentioned are autographs and fairly rare, especially the short prints. The Black Foil version only has five total copies, so it’s nearly impossible to get that entire set. 150 packs opened so far,438 doubles and still no card # 85 Grant Fuhr. 7 players I have 10 doubles,1 I have 11. CCPE: Shea Weber– The only CC: I have pulled so far.. Very satisfied with these pulls,but where Is base card # 85 Grant Fuhr !!!! Making me crazy!!! Lol! Good luck to everyone pulling(cracking) packs! I bought 5 packs and pulled 3 Heir To the Ice! 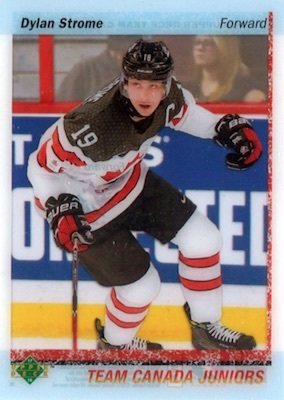 (1:10) I really like the overall look and feel of the cards and I love that there is now an affordable Team Canada set. Glen W – Name me one UD product that doesn’t cost a ton to collect? I can’t think of one! Why doesn’t the reply button work? N.B. – 1.99 a pack is very affordable although you’re suppose to buy something. Tell me how much you spend to complete the set and then let me know if you think it is still affordable!! Love this set!!! 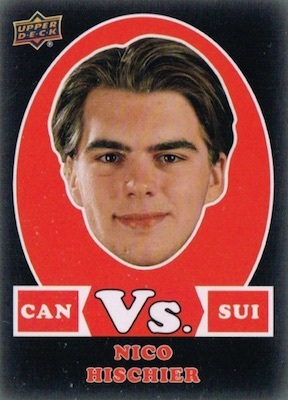 Question, why no Lindros in this set? HH I don’t plan on buying a lot of packs, I may or may not go for the set. I normally collect 1 set a year as well as all the rookies. I am a student who loves to collect cards… I don’t chase master sets so I don’t anticipate spending a lot. 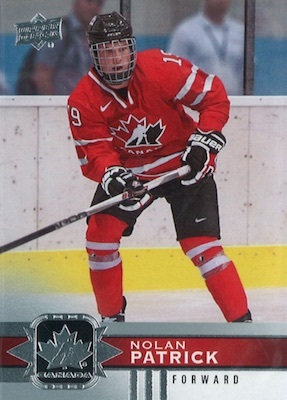 This set is much easier to collect than the Team Canada juniors that come out every year and I like the cards better than the comparable Tim Hortons cards. My store doesn’t require a purchase for the cards. Great product but very hard or at least impossible to collect the whole set. I have opened 6 boxes so far and while I have 5 1-100 sets, 1 1-140 set, a full set 1-12 retros, a full set of white VS 1-24 I only have one O Pee Chee clear, 4 clear cut, 1 canvas beyond number 50, a number of UD Exclusive (Silver) and 4 gold leaf signatures. Going to be a tough set. I hope along with others we can set up trade night here on Vancouver Island. Product is ok, would’ve been better if the SP 101-140 had a slightly different look and not the same players from base set. Maybe even make the SP cards championship versions of the base (ie. players with trophy, medal, etc.) At least these weren’t as bad as the Leafs Centennial diecut SP set that were basically the same card, but cut. Really good product and not too expensive. I just pulled a magenta printing plate one of one for Doug Gilmour. Anybody have an idea of what the value is? Great set. I’m 5 cards short from completed the 160 card set. One print plate of Mark Messier, two exclusives (Messier and Simmonds). Haven’t pulled one auto (as of yet). I have pulled two Versus Black cards of Lundqvist. Dave Roosa, I am in Victoria. Got 8 boxes…from three different stores here in Cambridge, ON. Need to complete master set…got lots of traders! 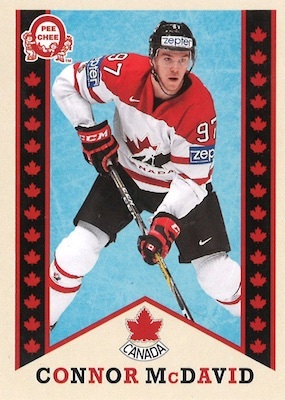 Hi Trey, quick question – i pulled 2 base cards in one pack without the canada logo on the bottom. I havent heard of these to exist nor have i seen them anywhere (ebay). Its not numbered nor does it have anything else distinct about it. Are these errors, rare cards, or just another parallel card to get confused over? Thanks! Sounds like a printing error but I have not seen nor heard about any widespread issue for this. My son and I love these cards! Our local Canadian Tire let me buy an unopened box the first time I went in and we have been picking up a couple packs every time we visit CT since then. Yesterday I grabbed 4 packs and hit the Nolan Patrick SP, which was a pretty cool find. Affordable and nice looking, I wish there were more products like this for the kids. A couple of McDavid Heir to the Ice patches have popped up on eBay. Don’t see anything about patches on the checklist. Has anyone pulled any of these? Those are custom cards that someone made themselves. The listing notes “DomSyn’S UpGraded (Customized Cards).” They were not pulled from packs. Thanks for the feedback. I agree with both your messages. It is frustrating that different stores allow the sale of the product in different ways. Just happens that my Canadian Tire is selling 5 packs by transaction. To this day they sill have the product. It has been a slow process but I shop there often and they allow you to do separate transactions each time you are at the store on whatever you buy. Today I bought three things and was able to purchase 15 packs. Finally finished the base set. I also got a Clearcut Program of Excellence Martin Brodeur card. Over the Christmas break one of my packs had a Travis Konecny Autograph. Anyways, love the product and hope to have it completed soon. I will try talking to a manager and see if I get to purchase a box being a great Canadian Tire customer. This product is probably the best Upper Deck has released for Team Canada, however why is it always impossible to get a complete final list. For instance almost 2 Months have passed and still nobody knows how many BLACK Canada VS were issued, is it a secret?, I have seen 5 so far, some say there are more like for instance Patrik Laine. Love these … but found the good cards must have been shipped out before the release date … I bought some later in the middle of January and each pack had NO sub-set cards just base cards … Puzzled as to how that can happen … oh well bought enough before that to put together a set of base and sp along with some inserts. Great set Canadian Tire Stores in Ottawa still have many boxes left, and I have never been refused multiple boxes without purchases. Still have not seen a WJC or POE card. Got 2 signature cards. This may be the best set to collect all year. I hope it will be done again next season. It would be cool if they could include an insert set remembering Olympic Gold Medals or the the famous 1972 year.